In this series we’re taking a look at homes sold at various price points around LA’s Eastside in the first half of 2017. Since homes in today’s market rarely sell at their asking price, we’ll be focusing instead on selling price. What will a budget between $800,000 – $900,000 get you on the Eastside and what kind of process should you expect? Read below to find out. 1055 Alta Pine Dr: This 1952 Altadena mid-century post & beam was designed by Case Study architect Kemper Nomland (but is not a Case Study home). This home was very well-preserved overall but needed some work & updates. Walls of glass bringing the outdoors in and a thoughtful layout are hallmarks of these incredible homes. Was asking $769,000 and sold for $900,000. 2303 Riverdale Ave: Frogtown continues to be one of the hottest hoods in LA. This 2bd, 2ba, 1,100 architect-designed Spanish home comes complete with restored hardwoods, central heat & air, solar panels, a remodeled kitchen, a full garage, a deck, and a meandering garden path leading to a pergola. Was asking $749,000 and closed 3 weeks later for $849,000. 3937 Roderick Rd: Enter this 1,486 sq ft Glassell Park Spanish home through a private courtyard and walk up the steps to panoramic views. This home features all the things we appreciate of this style and era – the hardwoods, arched doorways, and tilework – with the added bonus of a location right in the middle of the Eastside action. Was asking $749,000 and sold for $825,000. 1720 Winmar Dr: This Glassell Park home was a hot commodity and it’s no wonder, look at that yard and those views! The home was only 1,074 sq ft (though felt a little bigger due to high ceilings and it’s hillside perch) but the massive 7,694 sq ft completely enclosed lot is a rarity in this area, featuring both a flat grassy area and multiple decked hillside areas with views. Fully remodeled and sitting pretty on the edge of Glassell Park and Mt Washington, this home was asking $649,000 and went $181,000 over asking closing for a whopping $830,000! 4126 Sea View Dr: A great middle-ground between square footage and location, this 3bd 1,680 sq ft home sits on a super-private portion of Sea View Ave (one of the most sought-after streets in Mt Washington) and is walkable to coveted Mt. Washington Elementary. It could use some small updates but still has large bedrooms, nice hardwood floors, and a huge 8,914 sq ft lot. Was asking $799,000 and sold for $890,000. 931 New York Dr: This Altadena Craftsman is the perfect level of “needs some work but not too much work”. Keep the hardwoods and built-ins and put a pool in that huge backyard so you’ll have a place to relax after a long day ripping out that carpet upstairs. 2,701 square feet to spread out on 1/3 of an acre 5 minutes from the mountains and 15 minutes to downtown – you really can’t go wrong. Was asking $849,000 and sold for $865,000. 6309 Meridian: For a buyer wanting to be in the middle of the Highland Park action and also make some rental income, this 2,036 sq ft duplex hits all the marks. Classic character, built-ins, gleaming hardwoods, and moderately-updated kitchens/baths plus a nice backyard to round it all out. Was asking $799,000 and closed for $865,000. 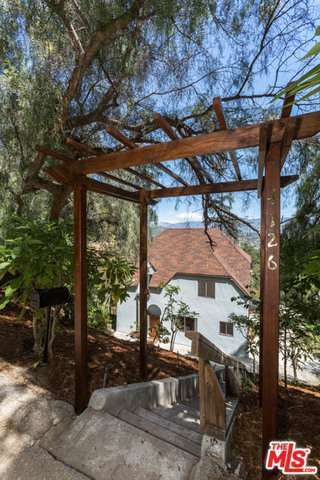 683 E. Pine St: Another great “live in one and rent out the other” opportunity in Altadena – this one is 2 separate homes totalling almost 2,000 sq ft on an exceptionally large 11,730 sq ft lot with fruit trees and vegetable gardens. The front house is a precious 1904 Victorian with great light while the back house is a 1bd/1ba lofted space with a lovely deck. Was asking $699,000 and sold for $800,000. 526 E. Avenue 39: This 2,180 sq ft Montecito Heights Craftsman makes my heart sing. It might just be all that colorful Jonathan-Adler-inspired staging mixed with the classic cool solid wood front door (thank you dear flipper/homeowner for keeping that original door! ), fireplace, hardwoods, and built-ins or it might be the decking, the views, the terraced yard, or the bonus space. Or maybe it’s that green kitchen tile. Either way, I’m into it. Was asking $849,000 and sold for $869,000. 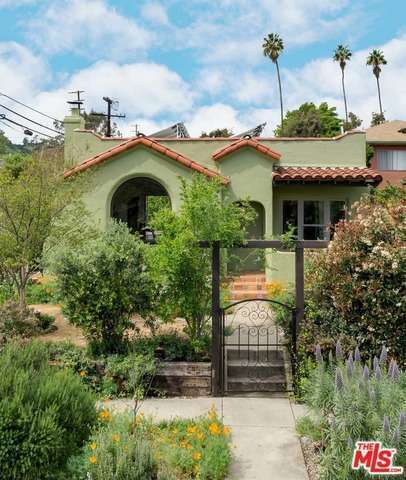 400 Carmelo Ave: This quintessential 3bd, 2ba California Spanish home is a great mix of the right amount of updates and the right amount of original character. Tucked into a quiet pocket of East Pasdadena, yet still a relatively close distance to tons of shopping and restaurants. Flat lot with mountain views. Great yard, yet not needing too much maintenance. This is the Goldilox of houses. Was asking $813,000 and sold for $836,000. This price point has so many great homes I actually had a hard time narrowing down what to feature. From this compound in Pasadena, to this ultra-modern small-lot home in Echo Park, to this well-rounded Victorian in Highland Park, to this well-situated South Pasadena loft (or this South Pasadena townhouse) there is literally something for everyone. What to expect with a $800,000 – $900,000 budget: This price point has a little something for everyone. You can be in a smaller but nicely updated condo or home in the hottest area, get a little more square footage for a slightly less-updated home in a great area, or go another 5-10 minutes out and get a large home with a mix of updates or even 2 homes on a lot. Though this price point has plenty of options, it also has plenty of competition. It’s not unusual for homes to go $100,000 or more over their asking price. Depending on what level of finishes and what neighborhood you’d like to be in, it’s safe to plan on shopping about $100,000 – $200,000 under budget to give yourself wiggle room for closing costs, bidding wars, and unexpected repairs. Huge congrats to my clients on their purchase of this lofty townhouse tucked into the woods on a private drive in lovely South Pasadena! Three levels with hardwood floors, slylights, a fireplace, and the most bucolic private outdoor space one could dream of in a townhouse, not to mention those legendary South Pasadena schools – welcome to The Good Life Frances and Andy!